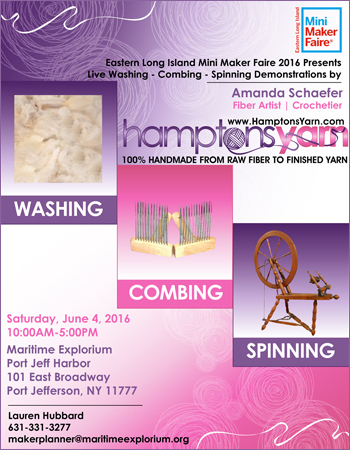 Description: Eastern Long Island Mini Maker Faire Presents Live Wool Washing Combing Spinning Demonstrations by Amanda Schaefer, Fiber Artist/Crochetier of Hamptons Yarn at Maritime Explorium in Port Jefferson, Suffolk County, Long Island, New York. The Eastern Long Island Mini Maker Faire is organized and hosted by the Maritime Explorium where we are interested in exploring creativity, innovation and entrepreneurship. The event is held on the waterfront in beautiful downtown Port Jefferson. The Eastern Long Island Maker Faire event will host exhibits, workshops, hands-on making and exploring for all ages from textiles to LED's. Interactive sculpture building, yarn bombing, food trucks, quilting, 3D printing,, meet the makers, meet scientists working on cutting edge tech projects, find out how scientist "Build With Biology" and so much more.